If you don’t already make kabobs or skewers or shish kebabs (as they are often called) then you are missing out on an easy grill dish! I often thought that kabobs were kind of fussy but they are in fact quite simple and quick to make. 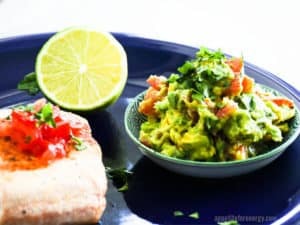 While they take longer to prepare than throwing a salmon fillet on the grill, the skewers cook quicker as the fish is cut into smaller pieces. Either way, this kabob recipe comes together in 30 minutes. Shish kabobs are an easy way to grill seafood, chicken or meat. 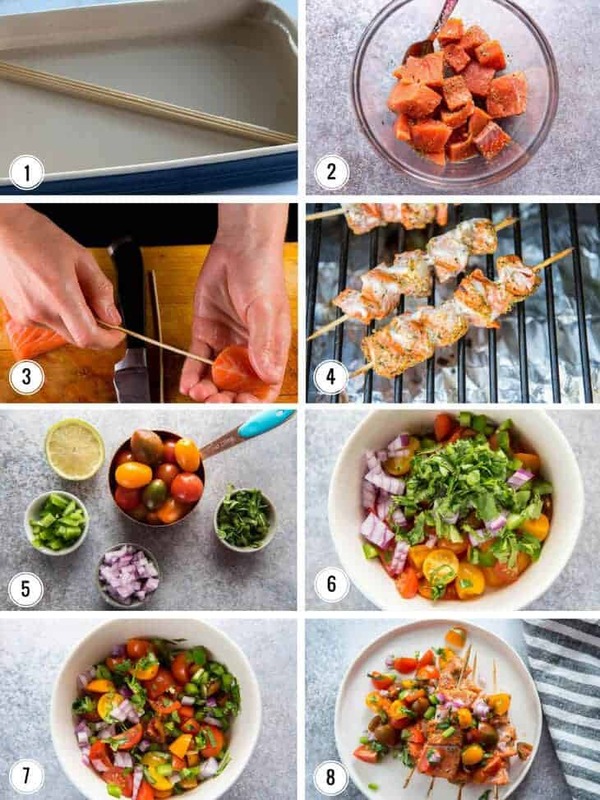 They also look spectacular so whip up this grilled salmon kabob recipe and seriously impress your guests. 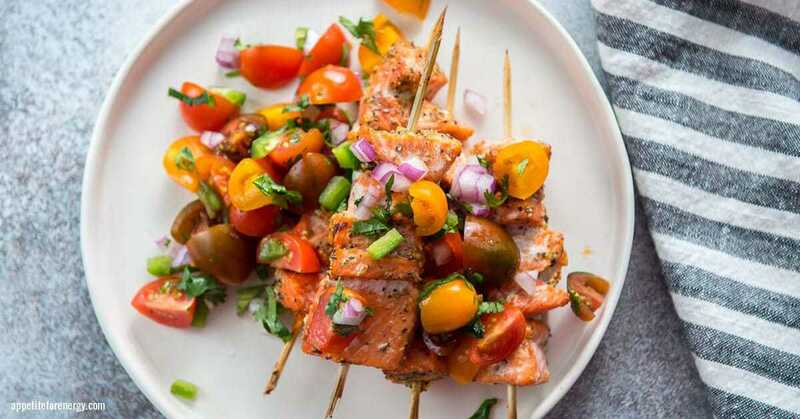 Top the salmon skewers with fresh tomato salsa and this gorgeous, fresh meal is complete. 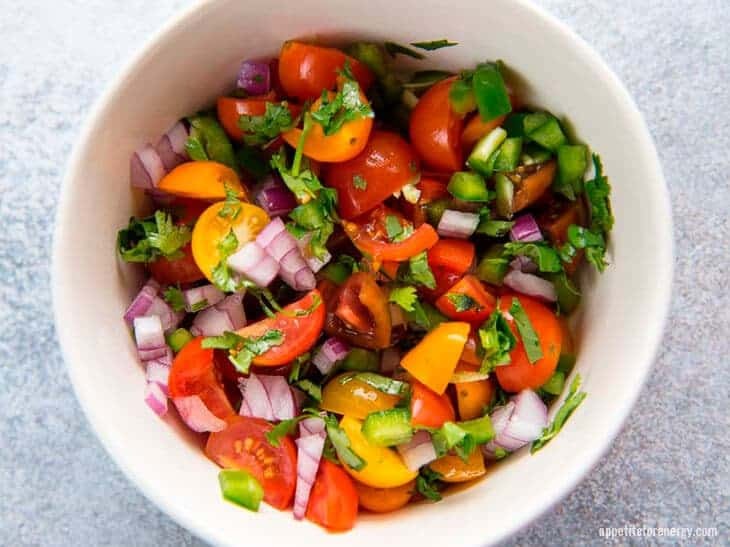 The tomato salsa is brimming with vibrant summer ingredients such as tomatoes, jalapeño, red onion, lime juice, and cilantro. It is a classic recipe that could be served over any type of kabobs or grilled protein. You really can’t go too wrong and once you’ve made it, you’ll find yourself returning to it again and again. 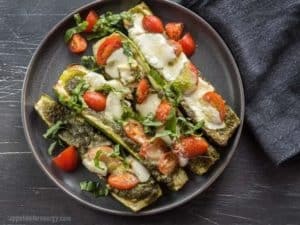 I like to serve Grilled Salmon Kabobs with these fun Grilled Caprese Zucchini Boats and a Low-Carb Spicy Margarita. Preheat the grill to 400°F (200°c). This is a medium-high heat. Always soak wooden skewers in water for at least 5 minutes before threading on the salmon, otherwise, they can catch on fire. Grilled salmon kabobs can be cooked on the stove top using a grill pan on medium-high heat. Cook for 10-minutes turning regularly to ensure all sides are cooked through. Salmon skewers can be cooked in the oven at 425°F (220°c). Spread out prepared skewers on one or two baking sheets lined with parchment paper, ensuring that they are at least 1-inch (2.5cm) apart. Cook skewers for 8-10 minutes, turning once. Grilled salmon can be cooked in the oven using the broiler (grill). Place skewers on a foil-lined baking sheet, on the top rack and cook for 6-10 minutes in total, flipping once. Vegetables can be added to the skewers such as sliced bell peppers, onions, mushrooms, zucchini rounds and grape tomatoes. HOW LONG DOES IT TAKE FOR SALMON KABOBS TO COOK ON THE GRILL? HOW LONG DO YOU HAVE TO SOAK WOODEN SKEWERS FOR? To be on the safe side, soak wooden skewers in cold water for at least 5 minutes while preparing ingredients for the kabob recipe. Then you don’t need to worry about the skewers catching on fire and ruining the food. There is great debate about this subject, however with some experts recommending 30-minutes minimum soaking time and others saying that soaking is not necessary. CAN YOU USE WOODEN SKEWERS IN THE OVEN? Yes, wooden skewers that have been soaked in water for at least 5 minutes can be used in the oven, toaster oven or under the broiler (grill). If using the broiler, be sure to use foil to line the tray and fold the foil over the ends of the skewers to prevent burning. HOW DO YOU COOK SKEWERS OR KABOBS IN THE OVEN? Preheat the oven to 425°F (220°c). Spread out prepared skewers on one or two baking sheets lined with parchment paper, ensuring that they are at least 1-inch (2.5cm) apart. 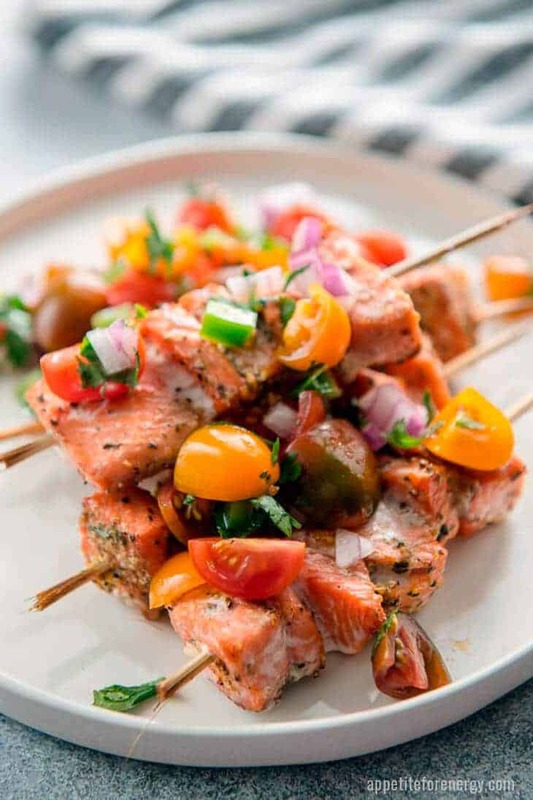 Cook skewers for 8-10 minutes, turning once or until the salmon reaches an internal temperature of 145°F (63°c). 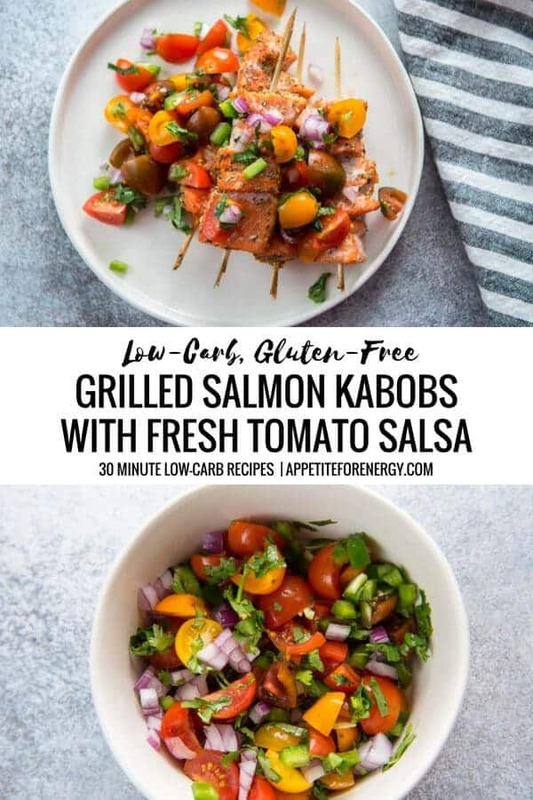 Salmon kabobs can also be cooked in the oven using the broiler (grill). Preheat the broiler and lay kabobs on a baking sheet lined with foil. Fold the foil over the ends of wooden skewers to stop them burning or use metal skewers. Cook for 6-10 minutes in total, flipping once, on the top rack. 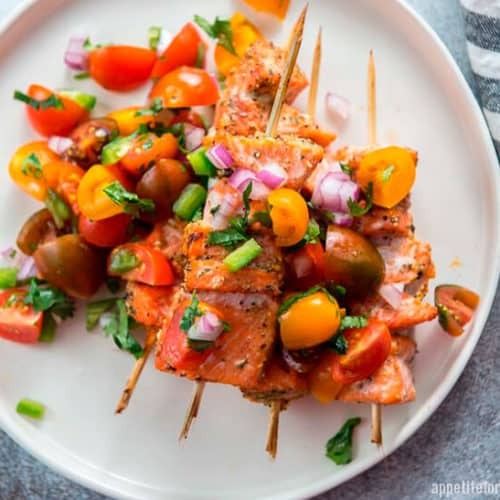 This healthy Grilled Salmon Kabobs recipe topped with a fresh tomato salsa is bound to become a firm favorite for lovers of healthy, real food. This sounds so summery and delicious, that salad is so full of texture and colour what’s not to like! 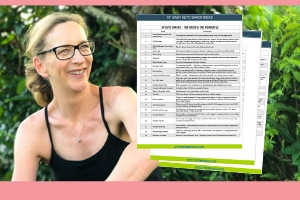 Yes – I love it for Summer. So easy and simple!